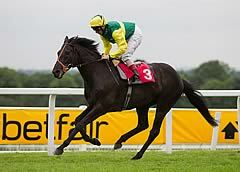 Aaim To Prosper created history by becoming the first horse to win the Betfred Cesarewitch twice. The eight-year-old previously won the marathon two mile, two furlong heritage handicap in 2010 and having not entered the winner’s enclosure since, was returned at 66/1 (£77.10 with totepool). Partnered by Kieren Fallon, Aaim To Prosper raced prominently and stayed on well close home to score by half a length from the 7/1 favourite Countrywide Flame. Successful trainer Brian Meehan said: “He won the race before, so why couldn’t he win it again? “Although he hadn’t won since he won this race two years ago, he had been campaigned in Pattern and Stakes company. “Kieren Fallon said when the horse ran here the last day that he would appreciate some cut in the ground and that has obviously made a huge difference. “He is a good horse and good horses can always come back and do it again. This horse is all heart and has won today despite being 20lb higher than two years ago. He has been committed and stayed on well, as he did two years ago. “Kieren has given him a wonderful ride,. He rode him here a fortnight ago and understands him. Kieren Fallon was enjoying a second victory in the Cesarewitch too, following on from Top Cees in 1999. The jockey said: “Aaim To Prosper was off the bridle the whole way - even leaving the stalls, I was having to push and scrub to hold my position. He is as tough as nails and he really wanted it." Class 2, Heritage Handicap, £160,000 Total Prize Fund. 3.30pm, Newmarket, Saturday, October 13, 2012. For three-year-olds and upwards, two miles & two furlongs. Weights: highest weight not less than 9st 10lb; minimum weight 7st 12lb. Penalties: after September 1, a winner 4lb; of any 2 races 7lb. Entries closed August 21 (97 entries, 1 subsequently). Weights revealed September 5. Scratchings deadline September 18 (81 remained), second scratchings deadline October 2 (66 remain), five-day confirmation stage October 8 (55 remained), final declaration stage, 10.00am, October 11 (34 runners). Form figures supplied by Weatherbys & are correct up to and including the racing of Wednesday, October 10. 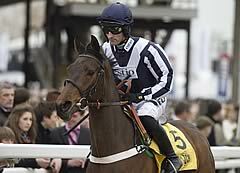 John Quinn’s Triumph Hurdle hero Countrywide Flame just failed to deny history when second to Aaim To Prosper. None the less Quinn was pleased with his charge, who was sent off the 7/1 favourite. Quinn said: “He’s run really well and I am really pleased - as pleased as one can be when coming second. “The winner kept pulling out, he was always holding Countrywide Flame but were very pleased. Jimmy Quinn, who rode the Haafhd gelding, added: “The winner had the ideal position all the way, and I half gave Kieren (Fallon) a lead and when we came to the top of the hill I thought I had him but Kieren’s mount (Aaim To Prosper) kept finding more and when I got to him he dug deep and found all the way to the line.